Panoramically positioned 10 minutes south of Margate and just 2.5km from Marina Beach, with its lovely Blue Flag swimming beach. 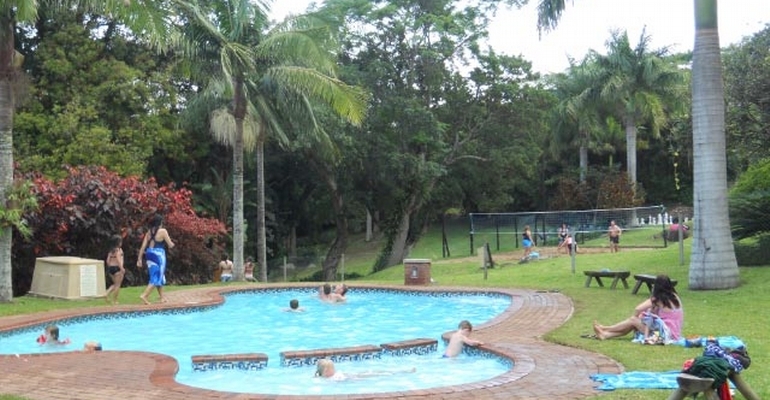 Paradise Holiday Resort is set on a hill amongst indigenous trees, which host a variety of birdlife, and commands superb inland and sea views of KwaZulu Natal's South Coast. The caravan park, with 40 superb grassed sites with electrical points situated under magnificent indigenous trees, has a 3-star grading from the Tourism Grading Council of South Adrica, and the resort is graded with "AA Highly Recommended", ensuring you and your family a good standard of accommodation. We also have 16 plettenberg park homes and 8 luxury log cabins, all fully equipped and serviced. Paradise is also a great venue for functions and parties with a difference! We cater for tours, sporting groups and motivational conferences. Catering for groups can be arranged on request; spit-braais are our speciality! Paradise offers a host of indoor and outdoor recreational facilities and the resort has 24 hour security, which is monitored by armed response, together with patrolling night guards. Paradise Holiday Resort is within easy reach of a multitude of amenities such as Shelly Centre, South Coast Mall, a host of restaurants, pubs, galleries and many more attractions.